Since releasing 2014’s Nabuma Rubberband, Little Dragon’s output has been limited to collaborations with Flume and De La Soul. Now, however, they’re returned a new, original single called “High”. Throwback synths welcome in the warm slice of alternative R&B, a track full of smooth, subtle low-end and snapping percussion. “High” is equal parts meditative and sensual. In addition to the new music, Little Dragon have announced their first North American tour in two years. The dates kick off in mid-April around their appearance at Coachella. 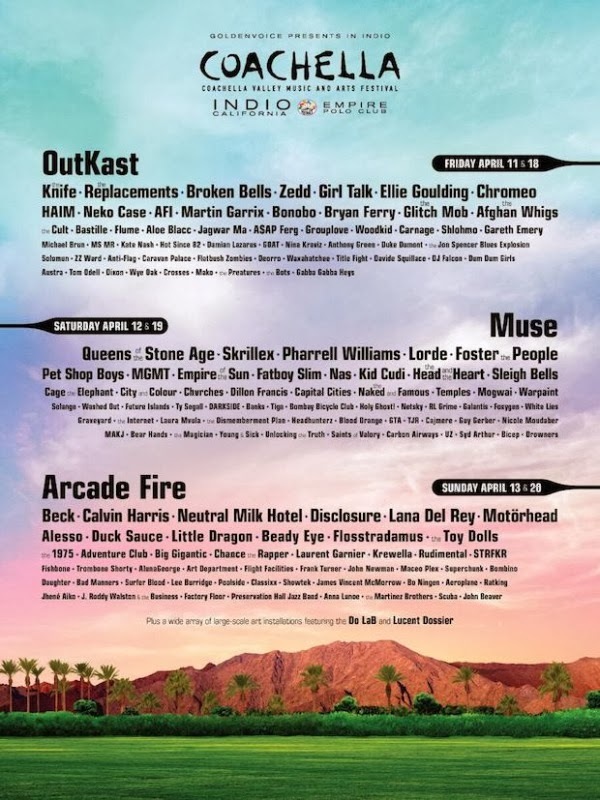 Un dels festivals més importants de l’univers indie, el Coachella que se celebra a California, ha desvetllat el seu cartell. El festival musical tindrà lloc els EUA els caps de setmana del 11 al 13 de abril i del 18 al 20. Hi haura tres caps de cartell d’autèntic luxe: Arcade Fire, Muse i els Outkast que tornen a reunir-se. Altres artistes destacats són Pet Shop Boys, Calvin Harris, Bryan Ferry, The Replacements, Neutral Milk Hotel, Beck, The Knife, Disclosure, Queens of the Stone Age, Lana Del Rey, Foster The People, Nas, Skrillex, MGMT, Haim, Girl Talk, the Afghan Whigs, Chromeo, Sleigh Bells, Neko Case, Lorde, Solange, Chvrches, Chance the Rapper, Darkside, Broken Bells, Rudimental, Foxygen, Mogwai, Dum Dum Girls, Austra, Washed Out, Holy Ghost!, Warpaint, The Cult, Factory Floor, Empire of the Sun o Jagwar Ma. Tots ells molt habituals en els nostres progames de Ville à Dômat i molts d’ells visitaran possiblement els grans festivals de casa nostra.